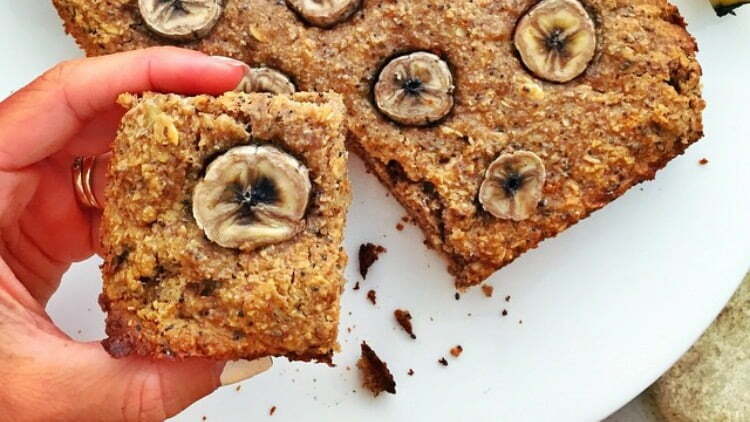 If you like banana cake, banana bread, or just cake in general (seriously, who doesn’t?!) then you need to try this recipe! 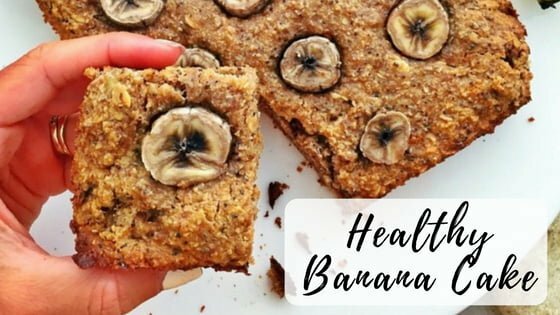 This healthy banana cake passes the taste test with all ages getting 10/10 from everyone who has tried it! It’s a staple in our house making the perfect morning tea or afternoon tea snack, dessert & even breakfast (yes it’s so healthy you could eat it for breakfast!). Made with whole foods like bananas and oats, it has a low GI & high fibre content, meaning it will stabilise your blood sugar levels & keep you feeling energetic & full! It has no added refined sugars, no dairy & no white flour like most banana breads & has a good protein content with its walnuts and chia seeds! Its also perfect for kids lunch boxes (if they have a “nut-free” school policy, just make it without the walnuts). Try it and let me know what you think! Place chia seeds in a small container & add water. Allow to soak 5 minutes. Place 3 bananas, dates, chia, oil & vanilla into a blender (I use a Vitamix but any high speed blender will do). Blend until smooth & creamy. Add cinnamon & baking powder and blend. Then add oats, 1/2 cup at a time, blending until smooth. Stir in coconut & walnuts. Pour into an oiled glass baking dish, top with 1 sliced banana & bake for ~20minutes or until knife comes out clean. Just wondering about for a LFM version with the bananas – would it be ok to use just ripe ones (and also quantity wise per piece) so fructose isn’t too high ? I made this last night and it’s good. It took quite a lot longer in my oven and as we only have a Nutri-Bullet, rather than a large food processor, I blitzed all of the ingredients and then added them together (which seemed to work fine). Taste-wise, mine was on the dense/moist side of life, but it’s good — definitely tastes like a healthier, less sweet version of traditional banana bread, while still being yum. How many calories in each serve of 12 roughly? Yes please I wanna know as well !! Can I use dried pitted dates instead of medjool dates? If do do I need to soak them in water to soften them? I made it without the dates and walnuts. I added 1/2 cup of saltanas instead and added 5 tbs of sr flour. Taste is delicious however rather dense and didn’t rise much. 10/10 taste test and so healthy!!! I’ll take it! This looks amazing! Thanks for sharing!! Yay thank you Cailee! So happy you like them! !